After breakfast Friday morning we hopped onto the tour bus for our trip from the Galilee panhandle in northern Israel to Jerusalem. We stopped first at Mt. Scopus in the northeastern part of Jerusalem. Mt. 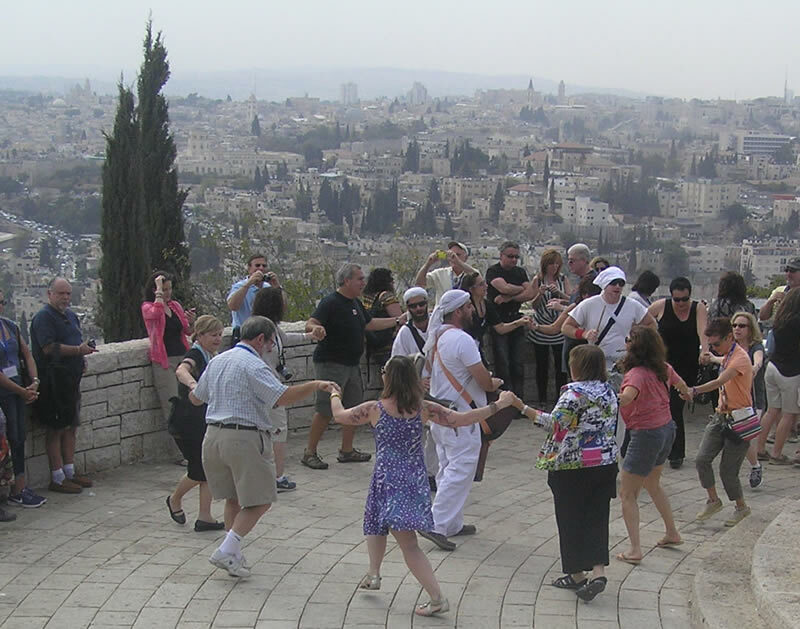 Scopus has an amazing panoramic view of the Old City, which makes it the perfect location for our group's Shehecheyanu ceremony. Shehecheyanu is a prayer to celebrate special occasions, such as entering Jerusalem for the first time. After the ceremony, which included prayers and singing, the tour leaders provided wine and challah. Some members of our tour broke out into dance. For our dining and dancing pleasure, music was provided by a group of street musicians. Israeli street musicians are just like the ones you find in the NYC subway. Except Israeli street musicians can also blow a mean shofar. After enjoying the view (and a bit of souvenir shopping), we headed into Jerusalem. I'm not sure if I ever mentioned this (recently, anyway), but as a newlywed I only knew how to make 2 main dishes: meatloaf and Fettuccine Alfredo (not at the same meal, of course). Over the years, I eventually learned how to make a few other items. 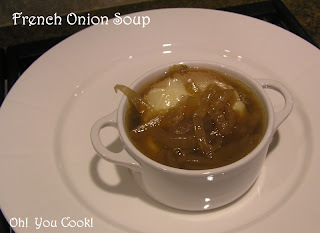 One of the earliest items was French onion soup, mostly because I received a set of soup crocks as a wedding gift and didn't want them to go to waste. Delicious as it was, onion soup was reluctantly moved to the back of the recipe file, mostly due to the necessity of having to stand in front of a hot stove and saute constantly for what seemed like hours on end, even when it took only 20 or so precious minutes (just like washing dishes seems like hours on end, even if it's only one plate). 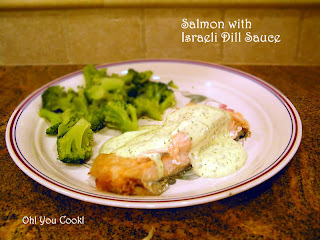 As part of a new irregularly scheduled series, I am going to share with you, Dear Reader, my recent vacation in Israel. This series will be half sightseeing, half family reunion, all recipe-sharing, and none in any particular order. To celebrate our 35th wedding anniversary, theHubby and I decided to visit a country we never visited before. Which is most of the entire world. We selected Israel because our older son is living in Israel, currently serving in the IDF (Israeli army). His commander graciously allowed him to join us for a good hunk of the tour we toured with. More about him and the tour in future posts. Israel citizens are very welcoming, and our relatives in Petah Tikva (a city just outside Tel Aviv) are no exception. As soon as they heard we were visiting, a bunch of them dropped whatever plans they might have had in order to host a dinner in our honor.